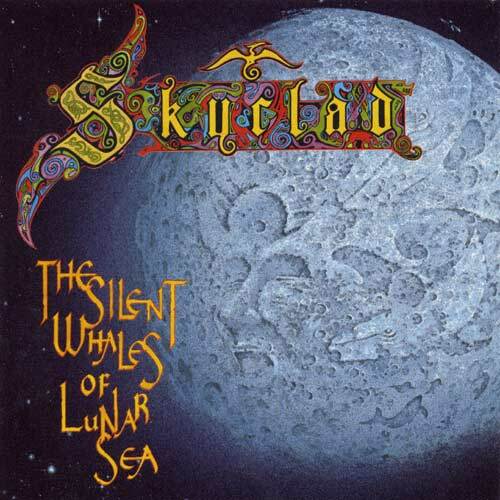 Skyclad: "The Silent Whales Of Lunar Sea"
The Silent Whales Of Lunar Sea is Skyclad's fifth studio album, released in 1995 and it was their last one for Noise Records. The outstanding and maybe weird album title is a homophonic (= having the same sound) pun (= the lowest form of humour) when said aloud in British or Australian accents, as it sounds identical to "The silent wails of Lunacy". The song writing is stripped down and more simplistic and the great songs just keep on coming on this album, Just What Nobody Wanted, Art-Nazi, Another Fine Mess, Halo Of Flies, all excellent tracks. The lyrics of Walkyier are again top of the bill, sometimes sarcastic (Just What Nobody Wanted) and sometimes bittersweet, like in Another Fine Mess. No fillers on this album and my personal favourite is still Halo Of Flies and that is not an Alice Cooper cover. 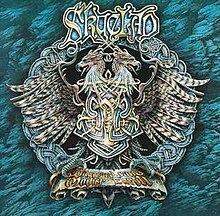 This fifth Skyclad album is again a must for lovers of true folk metal; people who like In Extremo or Finntroll should definitely check Skyclad out!! 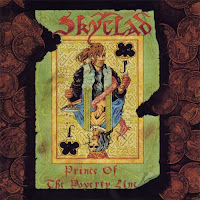 Skyclad: "Prince Of The Poverty Line"
Prince of The Poverty Line is Skyclad's fourth studio album and it is a concept album about urban decay in post Thatcherite Britain. This album is a benchmark album in folk metal, the magnum opus of Skyclad and it elevated the band to the status of the ultimate pagan/folk metal band ever! Prince of The Poverty Line is the perfect mix of the catchy rhythms of folk music and the aggression and heaviness of metal music. A Dog In The Manger (featuring a great guitar solo) is THE highlight of this courageous album and maybe that one might even be called the ultimate Skyclad track! 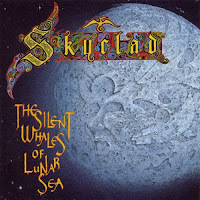 Other songs which belong to the best of Skyclad ever are: Cardboard City (great lyrics), Sins Of Emission (catchy) and A Bellyful Of Emptiness, a heavy song which almost takes you back to their debut album. This re-release also offers three bonus tracks, being: Brothers Beneath The Skin, Widdershins Jig (live version) and Cradle Will Fall (live). Especially the two live songs are excellently played, power driven folk metal at its best; play it loud. Thirteen years later Prince Of The Poverty Line is still an awesome album, a must have album for every rock/metal fan!! The third album of Skyclad is really the first one where the band clearly reduced the trash elements and it may also be their first true folk metal album. 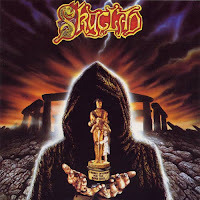 Maybe that came as a shock for the fans who really liked the trashy musical elements in the music of Skyclad, but it also gave the band new fans. Jonah's Ark is a rather diverse album as songs like A Near Life Experience (percussion all over) , The Wickedest Man In The World (guitar driven) or Earth Mother, The Sun And The Furious Host (with a nice fiddle-backed melody) are almost completely different. Highlight for me on this album is the longest track called A Word To The Wise, folk metal at its best! This new released edition contains 6 bonus tracks of which Emerald and live versions of Spinning Jenny and Skyclad are worth mentioning. 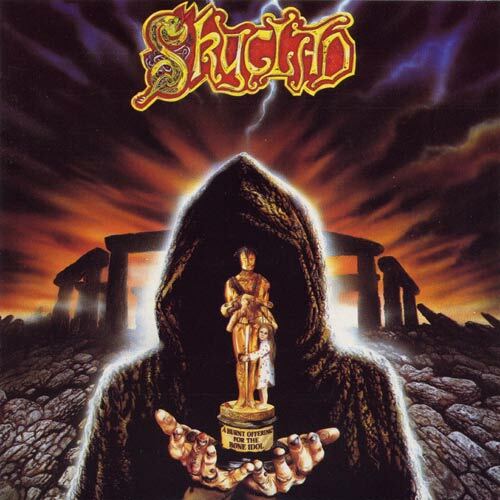 Skyclad: "Burnt Offering For The Bone"
The second album of the folk metal band Skyclad saw the band pushing their boundaries and they actually started experimenting a lot with blending the metal and folk musical styles. A Burnt Offering is therefore more melodic and definitely less trashy than their debut album which was released only six months earlier. New member Fritha Jenkins plays the fiddle and keyboards but the guitars still dominate their sophomore album. The song Spinning Jenny is a Skyclad classic mixing the metal and folk almost perfectly, while The Declaration Of Indifference is also a great song to listen to. But the absolute highlight of this album is without any doubt the last song Alone In Death's Shadow. Walkyier's vocals are almost brilliant here and the melodies are awesome; still A Burnt Offering For The Bone is definitely not their best album, but again a must for the fans of the band. 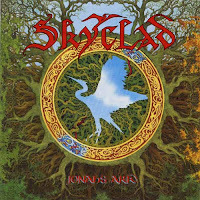 Skyclad: "The Wayward Sons Of Mother Earth"
The first five abums of the British heavy metal folk band Skyclad are now re-released and all the albums are 2 panel digipacks with informative booklets. The Wayward Sons Of Mother Earth is the debut album of Skyclad, who are the pioneers of folk metal. The band was founded in 1990 by singer Martin Walkyier (ex-Sabbat) and Steve Ramsey and it was their goal to create the first ultimate pagan metal band. This debut contains 10 songs which are very close to the trash roots of Walkyier's former band Sabbat. The best songs on this dazzling debut are: Terminus and the stand out song The Widdershins Jig filled with violins and keyboards creating something unique in metal music. Moongleam And Meadowsweet (great title by the way) is an outstanding ballad with beautiful vocals and an excellent guitar solo by Ramsey. Still highly recommended even if this album is already 26 years old. BRUCE FOXTON/RUSSELL HASTINGS - "FROM THE JAM LIVE"
So when is a tribute band not a tribute band? It's a tricky question sometimes, as the longer life goes on the more members of a band will leave, rejoin, split up, reform and go off to form rival iterations of the same band. I mean, we all know that John Coglan's Quo isn't Status Quo because there's no Rossi or Ross, similarly Oliver/Dawson Saxon. There would be no Iron Maiden without Steve Harris, so I guess it really boils down to key personnel, and in the case of The Jam that's Paul Weller. From The Jam have been delighting peiople on the live circuit for some years now, and although they have 'From The' tacked on to the band name they at least feature original Jam bassist Bruce Foxton, which for me lends them plenty of legitimacy. Having seen them myself, it also helps that they are a bloody good live band. 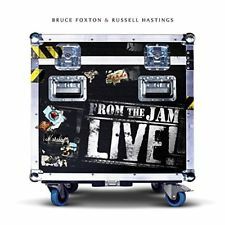 'From The Jam Live' doesn't throw any surprises at the listener, comprising of a robust 12 tracks, most of which will be familiar to even casual Jam fans. For newcomers to the band the most pleasant surprise will be Russell hastings, who may well be the perfect fit for the music in lieu of Weller himself. He's got the attitude, the accent, the intonation.... everything you want, really, To hear him belt out 'Down In A Tube Station At Midnight' with Foxton twiddling away on the bass behind is a real joy. the sound quality is beautifully clear, and whilst the songs sound very like they did in the studio, there's still a live rawness that retains a nice edge, emphasized on a six and a half minute version of 'The Eton Rifles' that closes the gig. From well known classics like 'Going Underground' and 'A Town Called Malice' through to lesser know but still classics like 'The Butterfly Collector' and 'Smithers Jones' this is a fine collection of Jam songs perfromed by guys with talent and passion. I thouroughly reccommend that if you liek The Jam you pick this up and then go and see them on tour. 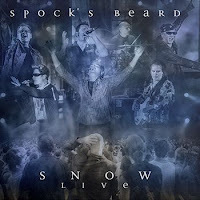 Spockís Beard fifth studio album Snow, released in 2002, was one of their best albums so far; unfortunately it was also the last Beard album featuring Neal Morse, as he left the band to become a musical "preacher".. Now, 15 years later you can enjoy a unique, once in a lifetime live version of the fabulous concept album Snow, featuring Neal Morse and all the past and present Beard members, being: Alan Morse (guitar), Ted Leonard (vocals, guitars), Jimmy Keegan (drums), Nick D'Virgilio (drums), Ryo Okumoto (keyboards) and Dave Meros (bass guitar). This album was recorded at Morsefest 2016 and it really sounds great from the first track Made Alive/Overture till the final track Made Alive Again/Wind At My Back. In fact the album is over before you know it as the band really plays awesome and very tight indeed. Highlights are: Devil's Got My Throat, Open Wide The Flood Gates, Solitary Soul and I Will Go. The band also plays two encores, being: June, the utterly boring acoustic track from the album The Kindness Of Strangers (1998) and a astonishing 27 minutes version of the epic Falling For Forever, which can be found on the compilation album: Spock's Beard, the first twenty years. Snow Live will be released on 2 DVD/2CD digi-pack, 3 LP vinyl (available in 4 different colours), 2 disc Blu-ray and as a 2DVD/2CD/2Blu-ray pack complete with a 48-page artbook. The first 200 artbooks will be signed by Neal Morse. Snow Live is a must for Beard fans!! The Dark Element sees the return to rocking of former Nightwish vocalist Anette Olzon, now teamed with Sonata Artica/Stratovarius songwriter/guitarist Jani Liimatainen. If that sounds like a mouthwatering proposal to you then you're going to freak out at the album, which successfully combines symphonic and power styles to great efect. Personally, I loved it when Anette joined Nightwish, preferring her melodic style to the operatic overtures of her predecessor. In fairness her own replacement has proved to be a perfect fit for the band, but I still hold a torch for her as the person who got me into the band and helped produce some memorable songs. One of those songs was 'Amoranth', and if you're fan of that bouncy style then you should get a real kick out of 'The Dark Element'. Whilst there's no orchestras present, they use keyboards to great effect and bombast, whilct Olzon provides beautiful melodic vocals with the hint of an edge to them. 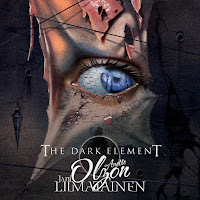 Liimatainen has brought to the table a fantastic ear for what works with Olzon's vocals, providing songs that are powerful, emotional and melodic, each one as catchy as the last. A good example of the use of keyboards is 'Halo', a bloody catchy tune that blends melody and power as well as brooding drama, featuring superb vocals from Olzon. If you search the web you can listen to the opening two killer tracks 'The Dark Element' and 'My Sweet Mystery', and these give a perfecr introduction to what is a killer album. 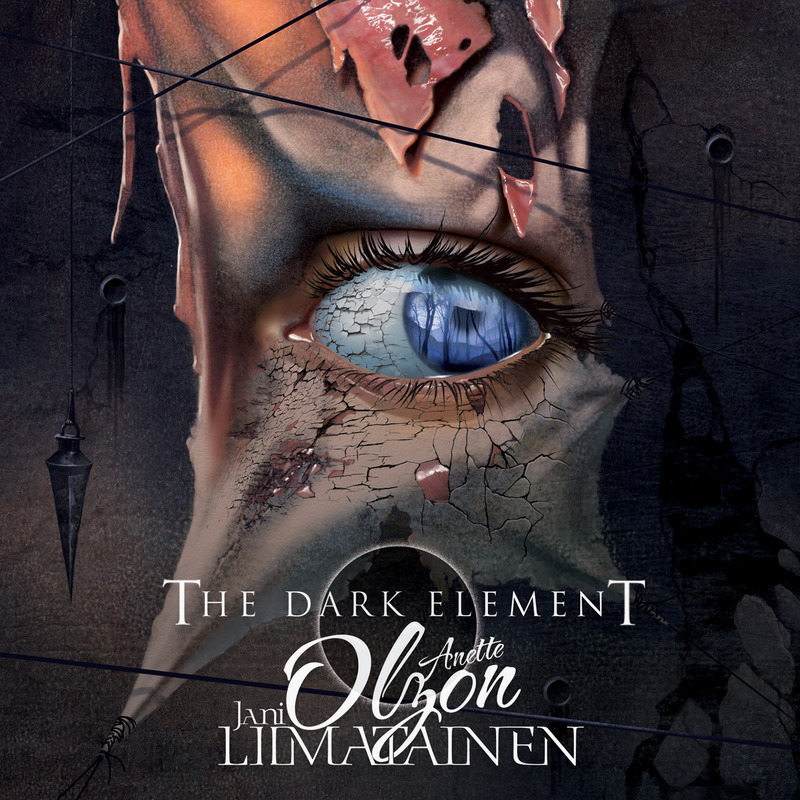 For those who miss Olzon's Nightwish days, 'The Dark Element' is a perfect reminder of what she brought to that band. The only problem is that it's so close to Nightwish's bouncier tracks in style that you wish the budget had stretched to some proper orchestration which surely would have made it an album deserving of that rare as hen's teeth 'RRRRR' rating. For now, I've taken half a mark off, but don't let that stop you checking out this excellent, upbeat and engergising album. 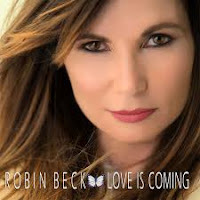 ROBIN BECK :"Love Is Coming"
There's plenty of fond memories of Robin Beck out there amongst Rock United readers, I'm sure. Whilst it's been a while since I've been that interested in her myself, the new she was partnering with Cliff Magness, who writes for Avril Lavigne and Kelly Clarkson among others, made he hope for a rocking album that would roll back the years as well as keeping in tune with current tastes. You know what? That's exactly what I got. 'Love Is Coming is a bit of a powerhouse of a pop rock album, if truth be told. The songs are bold and catchy, and Beck's vocals are strong and clear. Even when the tracks slow down a little there's still plenty of balls on show, and there's no 'First Time' on here, as it just wouldn't fit. Melodic power is the name of the game, as evidenced by the exciting one two of openers 'Island' and 'The Bright Side', whilst 'Me Just Being Me' is a blusey blast that brings to mind Sass Jordan or Melissa Etheridge. Alternately, if there's anyone out there with happy memories of Chrissy Steele, you'll adore late album stomper 'Girl Like Me', a rollicking rocket of a rocker that's probably my favourite track. Beck shows throughout that she can easily handle all the rock you can throw at her as well as sensetive ballads like album closer 'Warrior', which finishes off the listening experience nicely. I have to say that taken as a whole 'Love Is Coming' hits all the right spots. Robin Beck has made a good move by teaming up with Cliff Magness, and the partnershipo has produced one of the better albums of the year. There's no new ground broken, and not really any 'wow' moments as such, but there's such a constant stream of quality tracks that it's almost impossible not to have a good time with this. Well this could have gone so, so wrong. 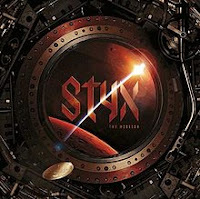 Styx decide to do their first studio album for a dozen years or so, and not only that it's a concept album that makes zero attempt to modernise the band's sound. I have to say I was a little appprehensive when I first played it, as I'm not the greatest fan of the band and also not the greatest fan of meandering prog. So what went right? The simple answer is 'everything', because 'The Mission' does everything it set out to do and more. It's an unapologetic concept album, concerning a manned mission to Mars, and no one could deny that it sounds like classic Styx. the thing is that at the same time it's a catchy, modern record with great songs that would still be great even without the theme running through them. The band have very wisely resisted the urge (and you can bet it was there) to intersperse the record with spoken word drama, sound effects and short mood pieces everywhere. Whilst there are a few short pieces within the 14 tracks here, they don't feel forced, don't get in the way and don't make your hand dart for the skip button. For example, short opener 'Overture' segues nicely into 'Gone Gone Gone' whiuch itself is a fantastic way to kick off the enjoyment as it gallops about with lively harmonies, a great refrain and a cool guitar solo, all in just over two minutes. Serously, between them it's one of the sweetest three and a half minutes to open any album. Styles are mixed up throughout the album, and naturally with such things comes some foot tapping as you wait for a track you like more, but in truth there isn't a bad song on the album, even if some shine more than others. listening to it you get a the strong feeling that this is a piece that was crafted rather than merely written. It's unmistakably 100% Styx, yet accessable to a pretty wide audience. There's a beautiful mix, bringing all instruments and vocals equally to the fore, and everyone gets their chance to shine, notably the great Larry Gowan on keyboards/vocals and there's plenty of first class guitar from Tommy Shaw throughout. As I said, I've never been a massive Styx fan but have always appreciated what I've heard. Heck, I like to do 'Come Sail Away' on karaoke at times, so make of that what you will. My appetite for prog tends to go towards prog with a bit of life and bounce in it, and 'The Mission' satisfies that taste perfectly, both complicated in structure, mixed in styles yet catchy and full of life at the same time. Certainly a contender for album of the year, 'The Mission' is also one of the best albums Styx have ever produced.